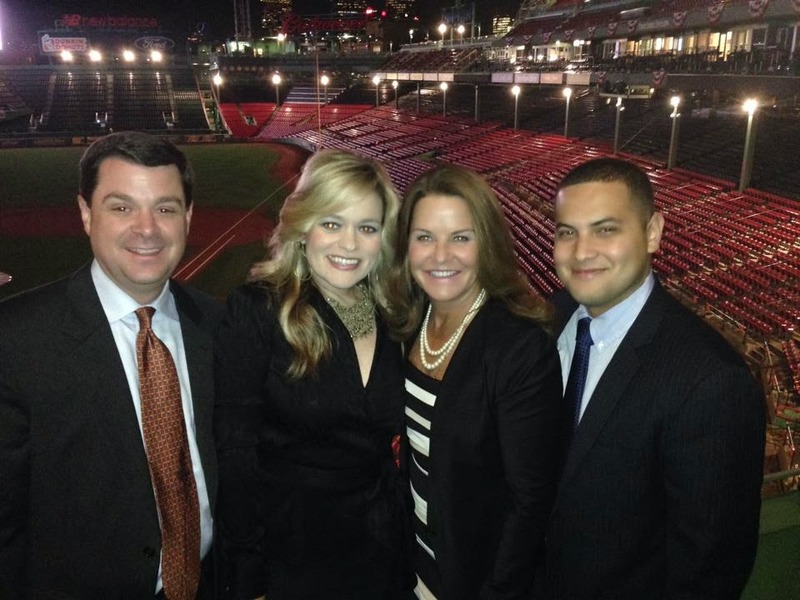 On October 17-18, 2013, Governor Jeb Bush and the Foundation for Excellence in Education hosted the 2013 National Summit on Education Reform in Boston, MA. As the Foundation’s flagship initiative, the National Summit on Education Reform annually convenes the best and brightest from around the world to share strategies to improve the quality of education for all children, everywhere. This one-stop shop of policies and practices offers an opportunity for lawmakers, policymakers and advocates to learn the nuts and bolts of reform. That many Oklahoma State Department of Education employees would be attending a Jeb Bush function isn't shocking. The OSDE has made Jeb Bush's foundation their one stop shop for nearly every education 'reform' made in Oklahoma, though, like so many other Republicans, Bush is merely pushing the Obama Administration's vision for remaking public education in America. 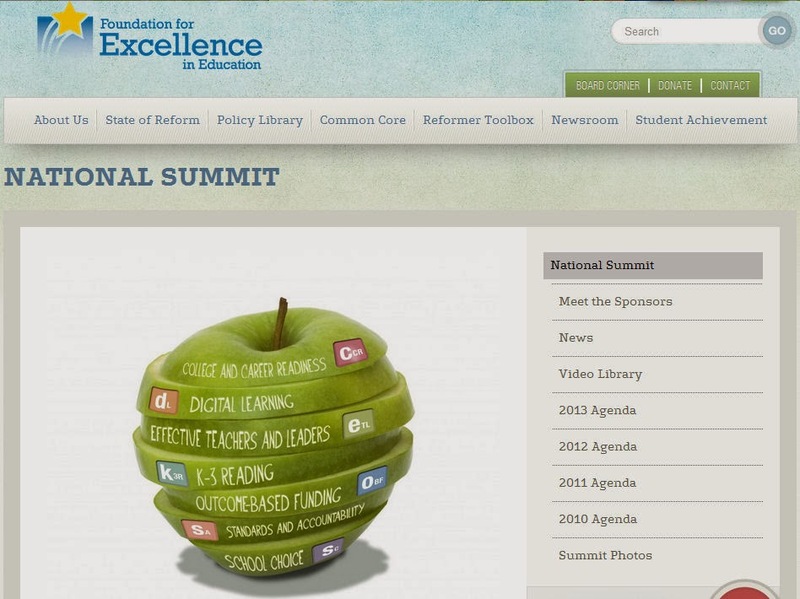 This section of the website devoted to last year's 'summit' lists the sponsors of this wonderful event (formerly/http://excelined.org/national-summit/meet-the-sponsors-2/) - a veritable who's who in the world that is now education corporate cronyism at its best; PEARSON, Microsoft, Exxon-Mobile and K12 (of course), as well as State Farm and Target among others. 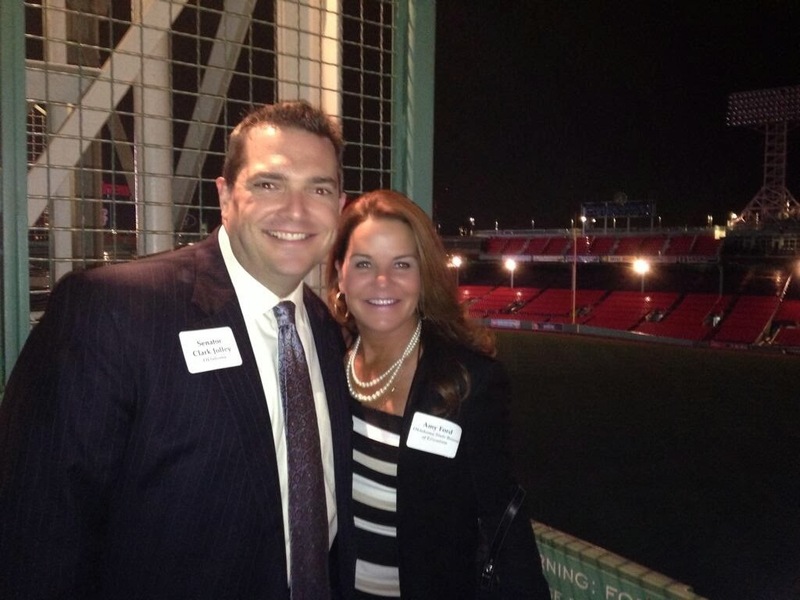 When we found pictures of the event posted on OSDE Board Member Amy Ford's website recently, however, we thought the public at large might be interested. 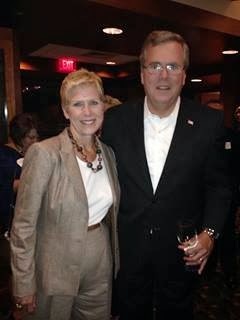 This is our state Superintendent - one of Jeb Bush's Chiefs For Change - wining and dining with the sponsor. 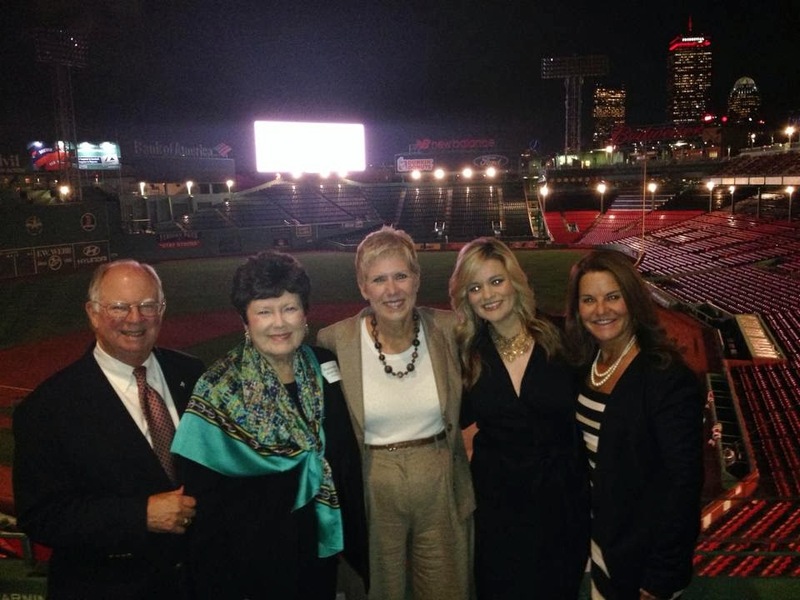 Here we have Senator John Ford, Chairman of the Senate Education Committee, Representative Ann Coody, Chairman of the House Education Committee, our Superintendent, OSDE General Counsel Kim Richey and OSDE Board member, Amy Ford enjoying an evening visit to Fenway Park. In this picture Stand For Children (archived link) CEO Brian Hunt and Stand staffer Martin Ramirez frame Richey and Ford. Senator Clark Jolley, Chair of the Senate Appropriations Committee and Ford enjoy the view from Fenway's upper deck. This is most concerning for this reason. This trip was made possible by 'scholarships' (yes, FEE refers to them as 'scholarships') from FEE. The THREE PRIMARY SOURCES OF BLOCKED COMMON CORE BILLS were given all expense paid trips to Boston to hear 2 days worth of information about Common Core - among other education reforms being pushed into Oklahoma from outside her borders via the benefits of big money, private foundations. Because I think Senator Ford is a kind, decent person, I contacted him for his comments about these photos and asked him about the trip. He told me he went on a 'scholarship' because the state did not pay for such travel expenses anymore and it was important for him to attend certain conferences. I told him this looked as though he was accepting favors - how odd for all the primary players to be 'scholarshipped' to such a meeting. He told me his mind was made up about Common Core after visiting with some superintendents and this trip in no way influenced his thought process on the topic. In fact, he told me that he could go to lunch with a lobbyist one day and vote against their bill the next. ROPE has assisted in now two separate Interim Studies on Common Core, the last in October of last year. Senator Ford never took the FREE TRIP across the rotunda from the senate to sit in on a single one of these study days - nor did Representative Coody - nor did Senator Jolley - nor did Board Member Amy Ford. Apparently we didn't have the funds to 'scholarship' these voices FOR the people of our state across the rotunda - or maybe our opinions don't COUNT because we don't have the BUSH name on our letterhead and multimillions in backing. Stand for Children has pushed Common Core into Oklahoma through bright shiny mailers, using Kentucky's cherry-picked numbers with money supplied by Bill Gates. ROPE doesn't have the kind of money Gates and Bush has to influence votes? Is that why our bills are getting BLOCKED in the Senate? Because the trips were not funded by lobbyists or the companies that employ them, there is no requirement that the lawmakers disclose the travel and lodging formerly linked here: http://www.newsobserver.com/2014/02/19/3637054/out-of-state-trips-precede-okla.html, said Lee Slater, Executive Director of the Oklahoma Ethics Commission. As a taxpayer I am outraged. Why does the state even have lobbying rules if lobbyists can just decide they don't want to be called lobbyists and work their money magic via PHILANTHROPY? We can only take Senator Ford at his word, not knowing what's in his heart, however, this entire trip looks very, very bad and it feels like us plain old regular taxpaying citizens got thrown under the bus yet again. Though the State Department of Education makes SNAIL MAIL the only way possible to get in touch with State Board members, I have linked each individual to their state page in the event you would like to contact them and ask these individuals why they could attend an out of state meeting paid for in full by the organization sponsoring the meeting, but couldn't walk for free across the rotunda or down the hall to any of the Interim Studies we worked so hard to present. Next Post: Is Oklahoma Education Being Sold to Out Of State Interests?